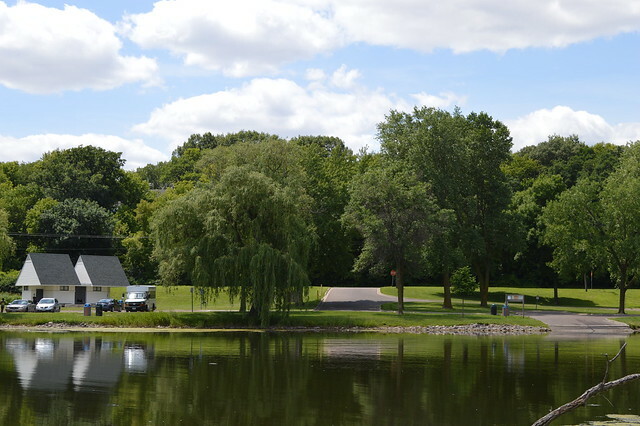 The oldest park in the Ramsey County parks system, Keller Regional Park is spread out into six sections along Highway 61 in Maplewood: Spoon Lake, Island, Lakeside, Lower Keller, Golfview and Round Lake. Photo by Elwin Fraser. Eight parking lots. Ample parking is available at the lot adjacent to Keller Golf Course. Tuj Lub courts (Golfview section). Archery range with 12 lanes (Golfview section). Boat lauch (Spoon Lake section). Fishing pier (Round Lake section). Shoreline fishing (Spoon and Lakeside sections). Paved trails and new boardwalk trail running from the Island section under Highway 36 to Spoon Lake. Beginning of tab section with 4 tabs. Left and right arrow keys will navigate between tab navigation links. Service bridge crossing to Island from parking lot. Handicap-accessible flush toilets (located off the island). Trail link access to Phalen Regional Park and Gateway Trail. Shelters 4 and 5 offer nearly identical amenities. Tuj Lub courts are located next to Shelter 6. Individual courts may be reserved or all three courts may be reserved for tournament play along with the nearby picnic shelters. Reserve the courts at 651-748-2500. Electric outlets with serving shelf.